The Common Assessment Framework is a standardised process to help practitioners assess children’s additional needs, develop a common understanding of those needs and agree a process for working together to meet those needs. This process can promote early intervention and help identify if support from additional services may be needed. 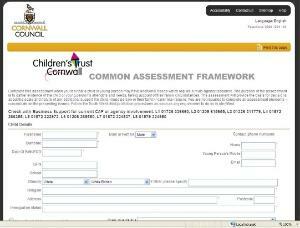 The Common Assessment Framework is a shared assessment and planning framework for use across all children’s services and all local areas in England. Who is the CAF for? The CAF is aimed at children and young people with additional needs that are not being met by their current service provision. The CAF can be used for unborn children and children and young people up to the age of 18, but its use can be extended beyond 18 where appropriate to enable the young person to have a smooth transition to adult services. In the case of youth support, the CAF can be used with young people up to the age of 19, and up to the age of 24 where a young person has a learning difficulty or disability. The CAF process is not for a child or young person about whom you have concerns that they might be suffering, or may be at risk of suffering harm. In such instances you should contact the Multi Agency Referral Unit following the South West Child Protection Procedures. If you need further guidance on the CAF process, please contact your Early Help Co-ordinator. Or, if you need any help or support in completing the eCAF form, please contact business support or the Early Help Co-ordinator in your locality. Have you thought about Early Support? If you are working with a child/young person with a special educational need or disability (SEND), you may like to consider using Early Support.